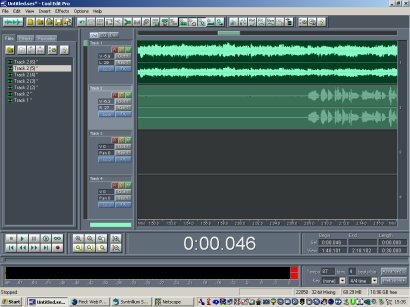 Did you ever tried to record your own songs on your computer? If the answer is yes, than CoolEdit might be the program what you need. With this program you can record for instance a guitar on track one, and then do the vocals on track two etc. You can change the volume of each track and add extra sound effects to it as well. You can use a maximum of 128 tracks, but on the other hand : you need a good computer with enough memory and a big hard drive to do that. 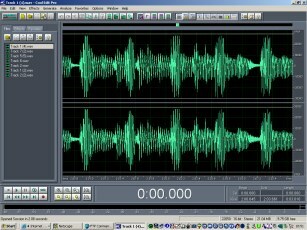 CoolEdit Pro Multitrack Harddisk recording for a maximum of 128! virtural tracks. 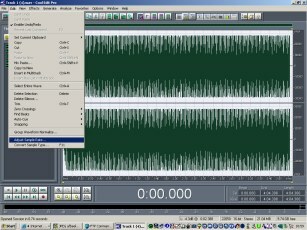 You can also enlarge a wave file so that you can cut unwanted noise at the beginning of a recording or to adjust the recording with a fade_in or fade_out. If I do some recording than I use a sample rate from 22 KHZ (than you use less space on your hard) and if I want to burn it to cd I create a "mixdown" from the tracks and then I adjust the sample rate to 44 KHz. If you like this description than you can download a 21_days evaluation version from this software via our site [19.805 KB] .